Another of the wonderful Dutch Golden Age painters, Elias van den Broeck was born in Antwerp in either 1649 or 1650. 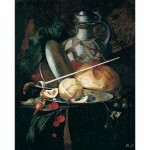 He was a student of Cornelis Kick, Ernest Stuven, Jan Davidszoon de Heem and Abraham Mignon. In 1665 he became a student of Cornelis Kick in Amsterdam. He went on to study with January Davidsz. 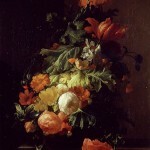 de Heem in 1669 in Utrecht. He spent time in Italy in 1672. Broeck moved to Antwerp with de Heem in 1673 and became a Master of the Guild of St. Luke. In 1685 he returned to Amsterdam where he lived until his death in 1708. 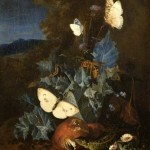 Elias van den Broeck is most well known for his still lifes of flowers, frogs, fruit and reptiles. 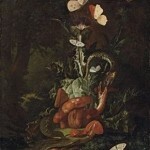 He painted objects as they appeared in nature. He maintained a garden to provide inspiration for his paintings.